Hi, what a awesome Giveaway! Thank you so much for this opportunity! I hope that you have a wonderful rest of your day! 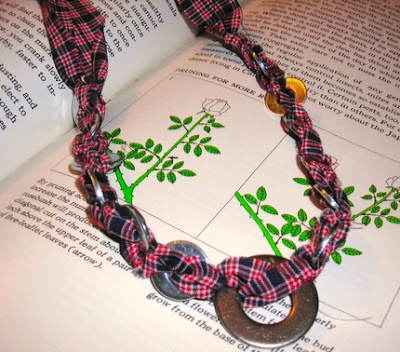 Today we are giving away a really unique and beautiful necklace from Julie of Belle Rose Designs: a Fabric and Washer Necklace. The winner will have their choice of vintage fabrics and a unique piece will be created just for them! You can view the fabric choices HERE. This giveaway will end at midnight PST, June 13, 2010. To enter, please leave your name and e-mail address in the comment section below. Only one entry per person. A winner will be chosen with Random.org and posted the following day. If we don't hear from the winners within 24 hours, they will be forfeit, and a new winner will be chosen. I love handmade jewelry. This is beautiful!